Learning a language takes time. Even if you can get far with a fairly small number of words if they are carefully chosen, you need to learn thousands and thousands of words to be able to really use a language well. The number of words you know is also very important for reading and listening comprehension where the writer or speaker usually won’t take the size of your vocabulary into account. Therefore, one large part of studying a new language is to simply to learn words. One of the reasons it’s harder for native speakers of English to learn Chinese and Japanese is that the vocabularies of these languages don’t overlap much with English. If you’ve studied French, German or some other language which is relatively close to English, you will surely have noticed that many words are similar or even the same. In Chinese and Japanese, we need to learn more words from scratch. This leads us to an obvious question: How do you learn and maintain a large number of words? Spaced repetition is one of the best answers and this is what Skritter is based on. In theory, it’s easy: You add all the words you want to know to Skritter and you simply study daily until you know all of them. Skritter will also help you review, so you can rest assured that when you use spaced repetition, you will remember most of the words you have learnt. Easy, right? Well, not really. We all know that we should study every day, and that the best time to review a word is roughly when it’s due in Skritter. Allowing the review count to increase to several hundreds or even thousands of words is a bad idea because you’re no longer using spaced repetition in an optimal way. There are many reasons you might find yourself with a large review count, but even if you have a good reason, your memory doesn’t really care. There are two reasons it’s bad to have a lots of cards due. First, spaced repetition is controlled by carefully researched algorithms that schedule your words roughly around the time when you would forget them if you didn’t review. Therefore, the longer a card is due, the likelier it is that you will forget it. Second, if you have a large due count, it probably means that you haven’t established proper habits for reviewing vocabulary. You should spread your learning out as much as possible. 5-10 minutes a few times per day can take you very far if done consistently over a long period. Enough preaching, my due count is sky high, what should I do? Let’s start by pointing out the only thing you really should not do. Don’t stick your head in the sand. The problem will not go away by ignoring it. Being 500 words behind schedule now is not as bad as being 1000 cards behind next week. Take action now! Turn off adding new words ought to be an obvious first step, but it doesn’t hurt mentioning it here. If you’re behind on words you have already learnt, you really don’t need even more words to review. You can start adding words again alter when you’re up to speed. 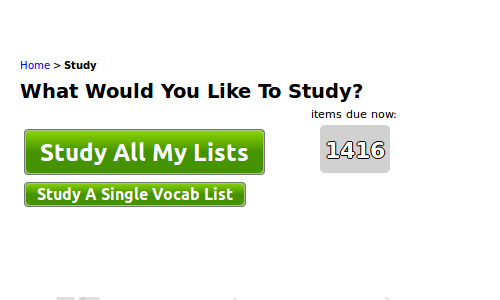 You can turn off adding from a list from your study page. Time boxing is by far the best way of handling large due counts (or anything else that is monotonous and requires a lot of time). It’s a simple technique where you set a timer and get as much as you can done during that time. I suggest 10 minutes for vocabulary review. Do these two or three times a day. If you feel up to it, you can do several 10-minute cycles in a row, but take a break between each. Read more about time boxing here. Use the “Save me” function (found under “My words”), which will spread your reviews out over a number of days. Don’t be over ambitious here! In theory, perhaps you could cover 1000 reviews in 5 days, but it’s much more likely that you will just give up. Make a decent estimate of how much time you have and then spread out the reviews accordingly. Read more about this function in the FAQ. Don’t get hung up on the number while reviewing. It’s easy to feel depressed when you have a large pile of words to review; you spend an hour studying and you find that you still have almost as many words still due. Try to focus on what you’re learning instead of the due count. 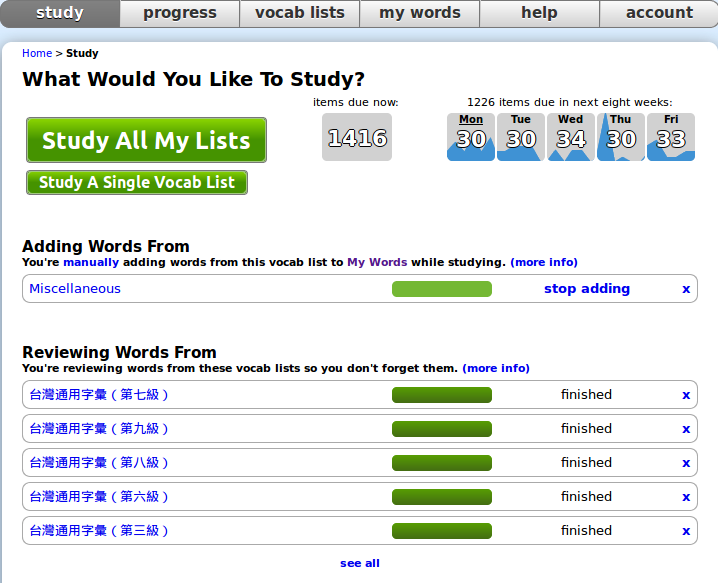 Each minute you spend studying vocabulary is good for you. Yes, it would have been better if you did it earlier, but doing it now is much better than not doing it at all! Hide the due counter to help you focus on learning instead of fighting an uphill battle against a large number. In the Android app, you can hide the due counter, which helps you avoid even seeing the due counter. It’s the fact that you’re now studying and making an effort to catch up that matters! When you feel comfortable with your due count again, you should consider how to avoid it from increasing too much again. One way of doing it is to avoid adding too many words. 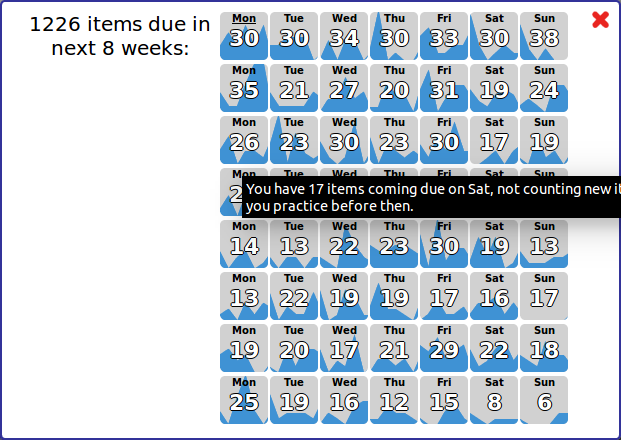 If you go to your study page, there is a tool in the upper-right corner that helps you calculate how many reviews that will come due in the next five days (you can also click to see data for the next 8 weeks). You might feel that you want to learn more words right now, but if the numbers for the next five days look a bit scary, perhaps you should focus on something else for a bit? If in doubt, just read or listen more instead. As I said in the introduction, you need to learn an awful lot of words and that takes time. Burning yourself out in the process certainly isn’t going to help.